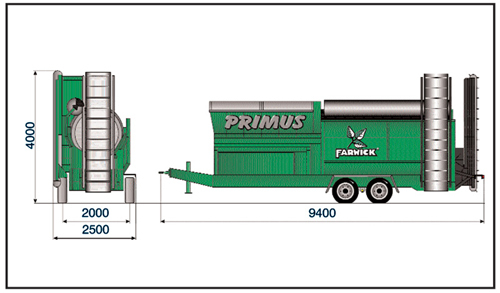 The PRIMUS can be used for screening compost, non recyclable wastes, mulched bark, wood chips, sand, gravel, contaminated soil and construction rubble. Rigid mobile screening machine with performance features of a professional machine and throughput of up to 70 m³/h. Effective operation due to large feeding hopper with a volume of 3 m² and a screening surface of 16 m². Easy operation of the foldable and extendable discharge belts as well as operational safety due to automatic straight-discharge control, hopper overload protection and motor protection system.